When the Soviet Union disintegrated, a large number of state and private printing companies, along with philatelic agencies, offered to print and distribute postage stamps and banknotes for the New Republics. Many of the Republics did not have adequate production facilities: Lithuania, for example, produced its first stamps in imperforate form simply because adequate perforating machinery was not available. The first perforated stamps were printed in (east) Germany. Azerbaijan contracted production of some of its first stamps to a company called "DSR Holdings Ltd" based in Jersey. 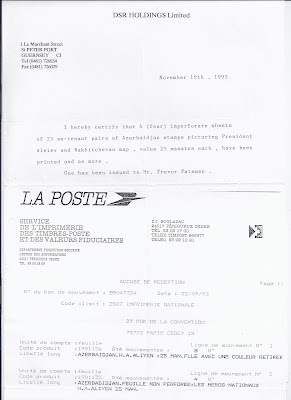 This company had some connection to France's La Poste - it may have been a subsidiary - and Azerbaijan's stamps were printed at La Poste's printing works. Both France and Monaco (for whom La Poste traditionally produces stamps) officially prepare imperforate stamps for sale to collectors - this subsidises the production costs for regular stamps. DSR did the same for Azerbaijan - but the Azerbaijan postal administration did not at first know that imperforates were being produced and sold. None were sent to Azerbaijan. Later, the situation was (I believe) regularised with some imperforates being sent to Baku. At the time (without knowing all this background) I was able to buy imperforates of the 1993 Aliyev issue (Michel 105/106), the 1994 Rasulzadeh stamp (Michel 131), and the 1994 Minerals set (Michel 136-39). DSR also produced two other issues: 1994 Mammadguluzadeh (Michel 130) and 1994 Nobel (Michel 132-35) but I do not recall handling imperforates of these issues. 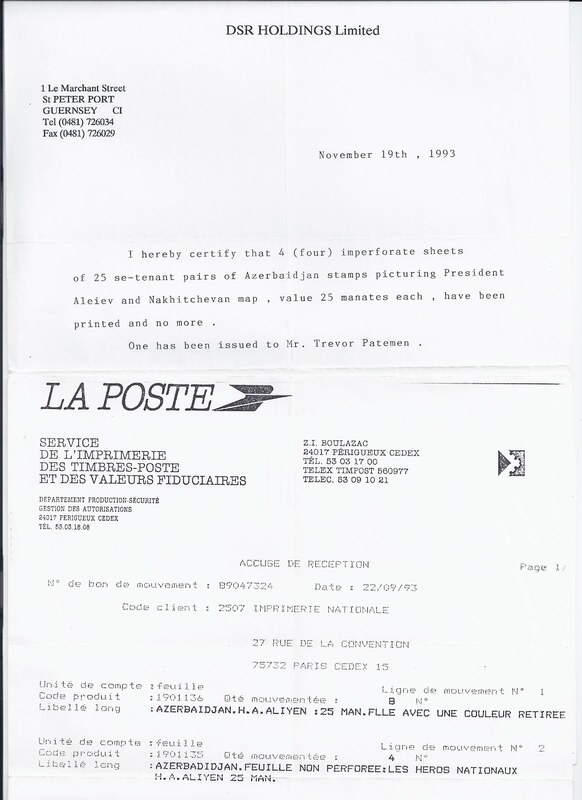 Above I show the letter I received to accompany my sheet of Aliyev stamps and the supporting documentation in the form of a print record from La Poste's printing works. Note that as well as imperforates, stamps with missing colours were also printed. I have no reason to believe that the print run figures I was given were false. There were 100 Aliyev imperforates (in four sheets of 25) and the later issues were, I recall, in editions of 300. Occasionally, you see these scarce items for sale. Some of them will have originated in my stock. Ah, the 1990s...Yes an awful lot of rubbish was produced, but it was great fun trying to keep up with what was happening. I still have large numbers of Ukrainian revalued stationery envelopes awaiting my retirement, most of them obtained from you. A Postmaster Provisional in a Dealer's Box!